Apple's newly launched retail self-checkout program, which allows customers to pay for an in-store transaction on their phone without speaking to a store employee, has reportedly gotten off to a successful start. Though the self-checkout option has "seemed a bit crazy" to some, the system is "working out," a person familiar with Apple's retail operations reportedly told John Fortt of CNBC. The person said that the benefits of the new system have, so far, outweighted the negatives. "This new setup could be particularly useful in a store like the one Apple's opening in Grand Central station on Friday," he said. "(I hear self checkout will be prominently touted there, which is no big surprise.) And the early success of this self checkout initiative bodes well for Apple's holiday sales. The apparent comments from someone involved in Apple's retail operations are an indication that the self-checkout option has not created confusion or encouraged theft in the company's stores, as some had initially feared when the program was launched. Those concerns led some to jokingly refer to the program, officially known as EasyPay, as "EasyTheft." 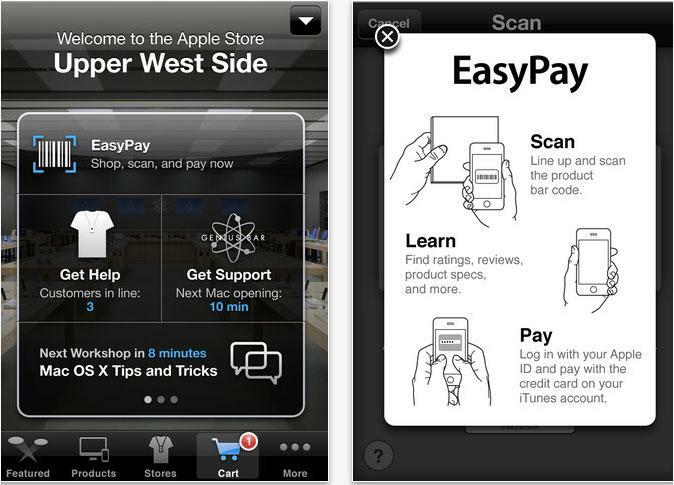 The EasyPay launched in November with the release of version 2.0 of the Apple Store application for iOS devices. With EasyPay, an iPhone 4 or iPhone 4S user can scan the barcode of an accessory while in store, and complete the transaction using the same credit card information tied to their Apple ID. The option applies only to accessories and items found on the shelf, which are some of the less expensive products offered at Apple's stores. Higher value items like iPhones, iPads, iPods and Macs are kept in Apple's retail stockrooms, and users cannot complete a self-checkout to purchase those items.